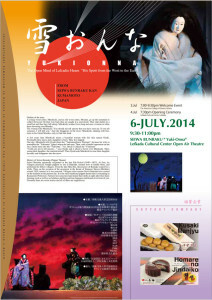 This reading performance first started in 2006 by Shiro Sano, an actor born in Matsue. Later, Kyoji Yamamoto, a world-famous guitarist, also from Matsue joined this performance. The combination of recitation by Sano and music by Yamamoto has created a unique atmosphere that expresses the world of Hearn’s “Kwaidan.” Based on its theme, Sano chooses the story to be recited based on a theme and writes the script, and Yamamoto adds mystic guitar music. This collaboration has successfully elevated the ‘recitation’ to the realm of art. We hope that this event will provide the audience with an opportunity to feel the beauty of Hearn’s works and to understand what he wants to communicate with them, introducing people to the appeal of his literature. We also hope the audience will experience the world of imagination Hearn experienced through storytelling, which he loved throughout his entire life. Seiwa Bunraku is a puppet play (Ningyo Jyoruri) which continues for more than 150 years in Seiwa Village, Kumamoto. It’s the villagers who have carried on this performance. The original costumes and heads of the dolls are kept in “Bunrakukan” building in the village. This traditional performance is played as many as 260 times a year. “Yuki-Onna” was added to the repertoire as Lafcadio Hearn, the original writer of the story, stayed in Kumamoto for almost 3 years. 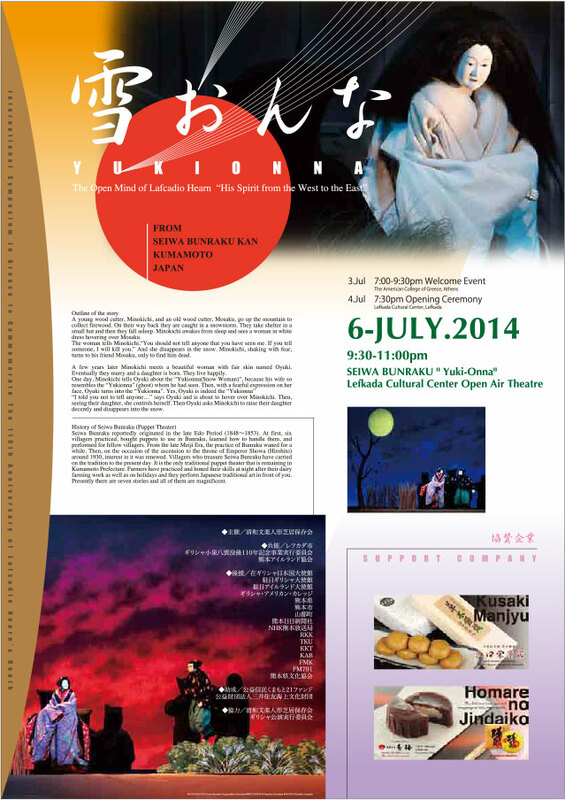 The script for “Yuki-Onna”, however, was written by Kazutoshi Hando. 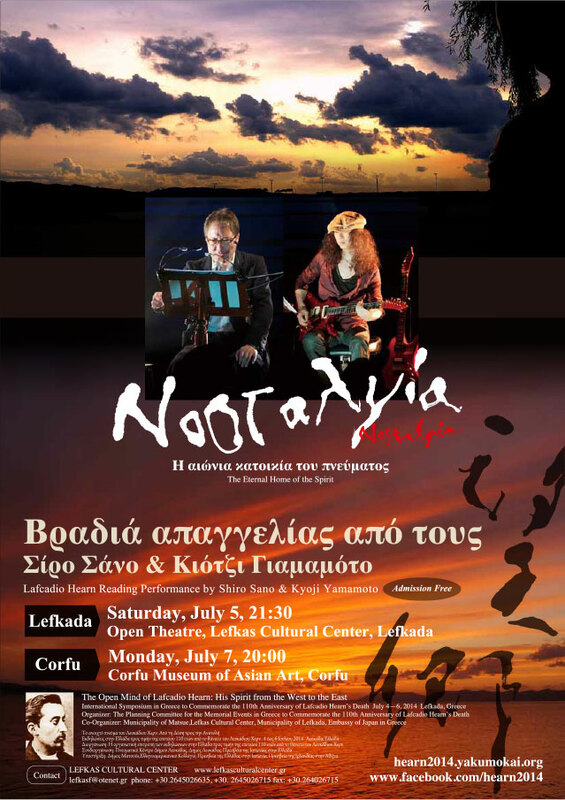 We believe that people in Greece will enjoy this traditional Japanese performance and will take the opportunity to feel the charm of a typical form of Japanese entertainment. 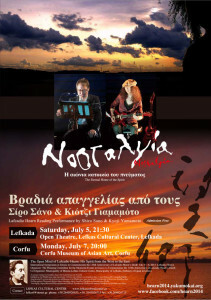 The museum is planned to be opened in the Cultural Center of the Municipality of Lafkada. 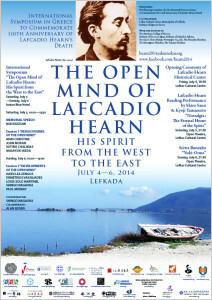 Copies of some precious documents related to Hearn’s family including the marriage certificate of Charles and Rosa, the birth and death certificate of Hearn’s brother Robert and the birth certificate of Lafcadio will be exhibited.